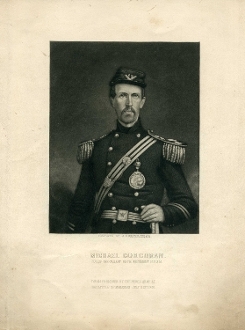 Michael Corcoran (1827-62), Colonel 69th New York Infantry; Brig. General, USA (Irland/NY). 1st Bull Run (POW), Suffolk campaign, killed 11/23/63 when horse fell on him. Mezzotint engraving by A.B. Walter, Philada. Small chip at lower right corner.